Let us introduce you to one of the most mysterious inhabitants of Mr. Qi. 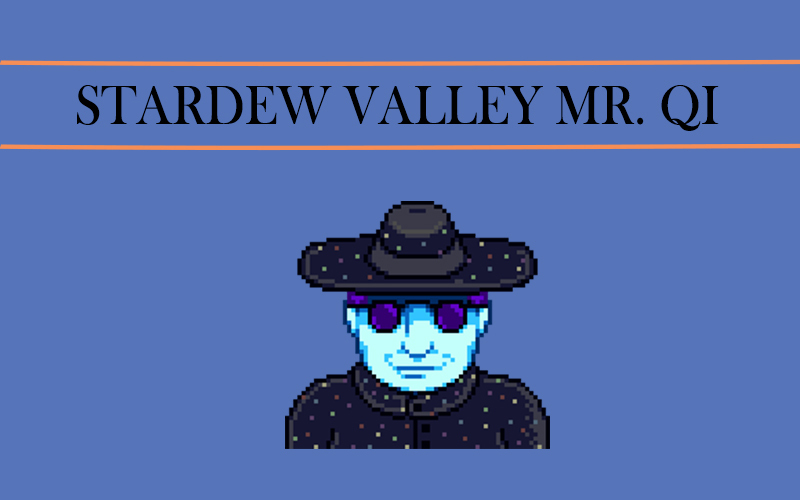 He owns the Stardew Valley Casino. You may have seen this building if you visited Sandy on the Calico Desert. Qi can be found in the Casino when Oasis is open (10:00 AM – 11:50 PM). You cannot become friends with Mr. Qi, nor give him any presents. You won’t be able even to enter the Casino unless you completed a few quests. If you try to enter the building before the quests are completed, the Bouncer will blow a Mega Bomb in front of you. So, be careful and play by rules! The first Mr. Qi quest triggers if you enter the Skull Cavern. As soon as you reach the 25th level here, Mr. Qi will reward you with 10,000 gold. Another Qi quest may be prompted by the lost book in the library, or if you inspect the box. If you go inside the bus tunnel and place a Battery Pack in the lock-box, you will find a strange note left by Mr. Qi. He will suggest leaving a Rainbow Shell on the train platform. Do it, and you’ll find another odd note from this mysterious stranger. This time, he will ask you to put 10 Beets in the Mayor Lewis’ fridge. The last note in this quest will be even stranger than before: Qi will request you to “feed the dragon”. That’s what you should do: go to the desert and find a parked bus. Go left from the bus, and you’ll find dragon bones. You have to put a Solar Essence inside the skull, and then you’ll get the final instructions. Inspect the lumber pile near your house, and you’ll finally get a Club Card which allows you to visit the Casino. By the way, you can test your luck and just try to run through the Bouncer to get inside. If your version of Stardew Valley game is older than v1.04, it may work.